Grammar formalisms are one of the key representation structures in Computer Science. 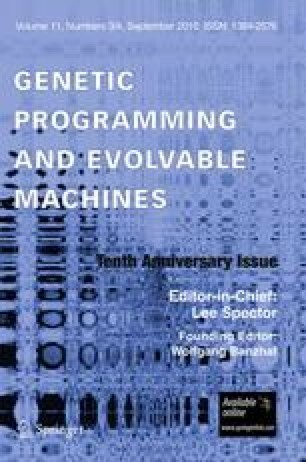 So it is not surprising that they have also become important as a method for formalizing constraints in Genetic Programming (GP). Practical grammar-based GP systems first appeared in the mid 1990s, and have subsequently become an important strand in GP research and applications. We trace their subsequent rise, surveying the various grammar-based formalisms that have been used in GP and discussing the contributions they have made to the progress of GP. We illustrate these contributions with a range of applications of grammar-based GP, showing how grammar formalisms contributed to the solutions of these problems. We briefly discuss the likely future development of grammar-based GP systems, and conclude with a brief summary of the field. The authors thank Kwong Sak Leung, Man Leung Wong and Brian Ross for insightful discussions that helped to form their perspectives on grammar-based GP, Kee Siong Ng for his suggestions at the final stage of editing. Thanks are also due to the anonymous referees, who helped us to shape the discussion more comprehensibly. Seoul National University Institute for Computer Technology provided some of the research facilities for this study, which was also supported by a Korea Research Foundation Grant funded by the Korean Government (KRF-2008-313-D00943). MO’N thanks Science Foundation Ireland for support under Grant No. 08\IN.1\I1868. NXH was partly funded by the Vietnam National Foundation for Science and Technology Development (NAFOSTED) under grant number 102.01.14.09 for this work.